Anyone that still needs proof of the miracles Simon Grayson has performed in getting us this far need only look at the transfer efficiency table below. The table uses the original purchase cost of each player in the current side and divides it by how many points we’ve accumulated so far. The calculations show Simon Grayson’s squad has cost him just £56,320 per point so far this season. To put that figure into context, the lowest amount spent per point of any team in the current top six is Crystal Palace who at £113,168 have spent double what Simon Grayson has on their current team. Leeds’ 25 points this season and the incredibly low £1.4m total cost of our team (less than any other team in the league) means it has cost Simon Grayson less per point than any other manager in the division – by quite some distance too. I brought these statistics up because I feel it’s worth nothing how little Simon Grayson has had to work with compared to the clubs we’re competing with. The figures do add some weight to Ken Bates’ argument that money doesn’t necessarily buy success, but the bigger clubs above us have spent significantly more on their squads. What we have at Leeds is a manager who is getting an unprecedented amount of value from relatively tiny sums of cash – which is just as well considering Ken Bates’ fascination with corporate accommodation. UPDATE: A few of you have complained that the above stats don’t take wages into consideration. 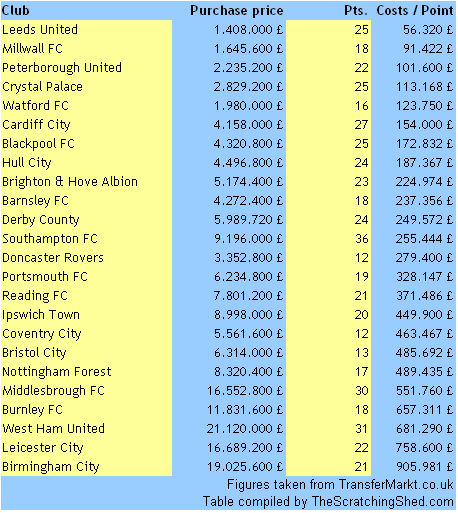 This wasn’t actually about wages, but since it’s been brought up I thought the below table may be of interest, showing Leeds United spend a much lower percentage of their turnover on wages than every team in the division except Burnley. For more, visit the The Swiss Ramble.